With the five-year, $750,498 grant, NSF recognizes the significant potential of Neunuebel's work, which focuses on how Legionella pneumophila bacteria elude and manipulate the defense systems of the host cells they target and infiltrate. The Legionella bacterium is named for a 1976 outbreak of respiratory disease that it caused during an American Legion convention in Philadelphia. The bacterium lends itself well to Neunuebel's research questions because it does extraordinary things to thrive and multiply once it enters a cell. Amoebas have been a "training ground for microbial pathogens" ever since they started interacting with bacteria billions of years ago, Neunuebel said. When Legionella meets an amoeba, for example, the amoeba wraps itself around the bacterium and starts a process to degrade and ultimately kill the intruder. But this bacterium has other plans. Once engulfed by the host cell, it remodels the membrane of what was meant to be a death chamber into a separate cocoon-like place where it not only escapes certain death but is able to multiply. "It's molecular camouflage," Neunuebel said. "For healthy individuals, it is usually not an issue. But for those whose immune systems are compromised or weakened, they could be at risk for developing a serious and potentially fatal form of pneumonia." How it does that is not well understood — and that is the immediate question Neunuebel's lab is addressing. How does Legionella target and change the host cell's membrane? It's fundamental work that will shed new light on the devices used by bacteria of other kinds that create their own protective compartments and could have implications for research in related diseases including tuberculosis, Q Fever, brucellosis and tularemia. The NSF grant also supports her ongoing work to help young students explore biology and develop a "science identity" — helping them imagine themselves as someone who could succeed as a scientist. She has several strategies for that, including curriculum development with underrepresented minority students and the ongoing work she and students in her lab have done with UD's Upward Bound Math/Science program and the Delaware Children's Museum's "Try Science" series. That outreach is a part of her work as a researcher and professor that she feels strongly about. "Being a scientist is more than managing a lab and doing experiments to test new hypotheses," Neunuebel said. "That's all part of the job, but that's not all it is for me. I love thinking about how to engage younger people." Opportunities were not plentiful when she was growing up in Romania, Neunuebel said, and she wasn't inclined to study medicine as her parents suggested. But her interest in biology grew and during her studies at Babe?-Bolyai University she volunteered in the lab of molecular biologist Nicolae Drago?, working with cyanobacteria. "This is where my love for scientific research began," Neunuebel said. Now, she hopes to help ignite interest in science and expand the options for others. The Upward Bound program offers four years of support and opportunity for 66 students from challenging socio-economic situations. UD's chapter works with students from five area high schools including McKean, Glasgow and Newark high schools in Delaware, and Elkton and North East high schools in Maryland. "She has been extremely supportive and so impactful for the students," said Camille Sims-Johnson, director of UD's UBMS program. "And the students are ready to go — you hear it in their conversations. We see their grades go up just from having the lab experience. We get those reports from [school] counselors all the time. "She is one of the best. She really cares about these kids." A new UD doctoral student on a three-month rotation in her lab knows the value of Upward Bound in a personal way. Ron McMillan, who grew up in Wilmington, Delaware, and got his bachelor's and master's degrees at North Carolina Central University, was part of the program when he was a student at Mount Pleasant High School. He was excited to hear about Neunuebel's involvement in the program. "Upward Bound was a catalyst that allowed me to see myself in school," said McMillan. "It helped me out and people mentored me…. And it's really important for me to be getting involved with the youth, especially those from underrepresented and underprivileged backgrounds." 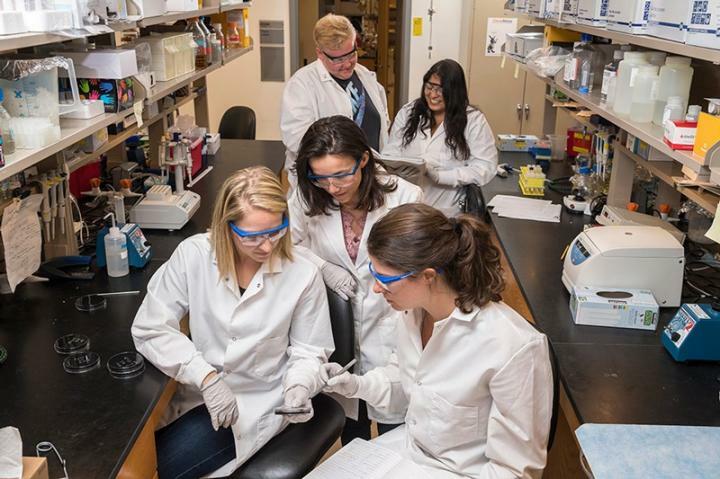 Ramona Neunuebel is an assistant professor of biological sciences at UD, whose focus is on microbiology, especially bacterial pathogens and their survival strategies. She earned her bachelor's and master's degrees at Babe?-Bolyai University in Romania and her doctorate at Texas A&M University. Before joining UD's faculty in 2014, she did postdoctoral work at the National Institutes of Health.